Not to be confused with the US country pop band of the same name, Lone Star are one of the best kept secrets of British rock. That said, their beginnings are not so great: their eponymous debut is an okay 70s rock offering, but few of the songs stretch the bands talents. It’s only really notable for being produced by Roy Thomas Baker (most well known for his work with Queen and The Cars) and featuring an extended workout of The Beatles’ ‘She Said, She Said’. Very few people would consider it an essential album. By the time of their second release – 1977’s ‘Firing On All Six’ – original vocalist Kenny Driscoll had been replaced by John Sloman and the end result is a marked improvement. Not just for the arrival of an obviously superior vocalist, but for the technical aspects of the release – in terms of production, albums rarely come better sounding than this. The opening track ‘Bells of Berlin’ showcases the band’s talents on an extended arrangement which couples a UFO-style guitar riff with an early Magnum keyboard approach. The intro is especially bombastic, with the keyboards breaking into a fanfare which sounds a little like a superhero theme. Things then drop out and vocalist John Sloman puts in his first appearance, singing gently against a clean guitar. It’s relatively simple, but he is in great voice here. When the rest of the band rejoins the arrangement, Dixie Lee’s shuffling drum rhythms and Pete Hurley’s bass provide the perfect compliment for each other, pumping mid-paced rhythms providing plenty of oomph. On its own merits this would be great enough, but midway through this track when the drum fills really kick in, it’s more than apparent that Gary Lyons’s production on this album is truly amazing. The drums are loud and natural sounding, the bass has a superb presence and there’s a distinct separation between each of the instruments. With the volume cranked, this is nothing short of a rock masterpiece; perhaps the most overlooked classic track of the decade. Although ‘Bells of Berlin’ is arguably the best track on the album, the various cuts which follow are all incredibly strong, with even a couple of weaker offerings eclipsing some other bands’ best. The mid-paced stomp of ‘Ballad of Crafty Jack’ allows the band to stretch out on something less complex. ‘Strombringer’ era Deep Purple provides the most obvious influences – especially since Worsnop trades in the synths of the opening track for a more traditional Hammond organ (used merely for colour). The main thrust of his keyboard work cerntres around flourishes played on a tack piano – presumably to reinforce the bad guy, wild west themed lyrics. Chapman is in great form on this track, too, offering a bristling solo which mixes bluesy vibrato with hard rock squeals. Half of his solo is placed under phasers and effects, which diminishes its overall power a little, but we mustn’t forget that this is a very seventies record, and in 1977, such effects sounded far more impressive than they do today. ‘Time Lays Down’ offers a mid 70s funk groove, almost a proto-disco influenced hard rock, where Sloman’s voice bares a passing resemblance to Glenn Hughes in places. The number is home to one of Hurley’s strongest bass performances, rarely breaking from a pumping sound which gives the number a great muscle, while Paul Chapman lays a distinctive counter melody in places with a vocodered guitar line. Once you’ve thrown in some over the top Queen-style backing vocals, it ends up being very much a product of its time, but if you’ve maintained a strong loyalty to seventies rock over the passing decades, this really ought not be a problem. The hard rock meets funk of ‘Rivers Overflowing’ sounds sharp, thanks to another fantastic Glenn Hughes inspired vocal from Sloman and upfront bass work from Hurley, interwoven by some very Stevie Wonder-esque clavinet playing by Rick Worsnop. In a better world, this would be remembered as fondly as some of Deep Purple’s ‘Burn’-era work. Lone Star are fantastically tight on this number, and while Gary Lyons’ production makes the drum sound the dominant force throughout huge chunks of this track, and the main grooves are provided by that clavinet and bass, Chapman’s guitar contribution really should not be overlooked. Throughout the number, he offers big angular chords, which although a little disjointed, play a pivotal role. Without their musical colour, this track would be all bounce and no drive. This is particularly obvious by the time Chapman steps up for his solo, which – provided you can listen beyond Hurley’s superb bass – is full of fire and passion. ‘Lovely Lubina’ begins like a fantastic Free influenced piece of bluesy hard rock, driven by Dixie Lee’s drumming which, again, is very loud in the overall mix (a technique Lyons revisited on Saxon’s 1985 album ‘Rock The Nations’, though it’s not present in all of his work). The verses feature a great guitar riff and clavichord sound, over which Sloman seems keen to channel his inner Robert Plant. For the chorus sections the mood changes completely, being dominated by huge 1970s backing vocals, in a Queen and Aviary style. Both the hard rock of the verses and unashamed pomp of the chorus both have their place; at the time of this album’s original release, you’d be hard pushed to find such hard rock pomposity served up with such great style. ‘Hypnotic Mover’ features some great harmony vocals and another superb bassline. Chapman’s solo is one of his best this time out, but even though there’s a few great moments here, there’s a weak link regarding the overall arrangement; the general tone of the piece is fine, but Worsnop returns to the tack piano – offering nothing different to before – and a couple of Chapman’s guitar fills are just a little too country. It’s not a bad song overall – and certainly streets ahead of anything from the Lone Star debut – but measured against a couple of the bombastic brilliance of most of ‘Firing On All Six’s material, it falls a little short. The album’s ballad ‘Seasons In Your Eyes’ provides some respite from the in-your-face drum sounds and rock posturing. Not only does it feature an almost faultless performance from Sloman – who gets to rein things in a little, due to the absence of drums on this number – but also Worsnop’s electric piano and harpsichords provide more than pleasing accompaniment throughout. In place of the rock percussion, Sloman, Worsnop and Hurley are backed by a full orchestra which is absolutely beautifully arranged. Be warned – it’s lovely, but it’s syrupy, perhaps rivalling the most soppy Styx ballads. The closing track, ‘To All of Us To All of You’ has an opening riff which sounds like ‘Burn’ with one of the chords changed. Once again, the rhythm section are heard in fantastic form, while parts of Sloman’s lead vocal comes with a real vigour. The lead musical parts aren’t always as inspiring as some of those previously heard on the album – Worsnop’s widdly keyboard solo is a little ugly and Chapman’s contributions, in particular, sound uninspired beyond the opening riff. It doesn’t matter too much though, since any shortcomings are disguised by a choir of pompy vocals which crank up to levels of extreme unsublety, making the track sound like Free fighting with Head East, with Styx man Dennis DeYoung as referee. If nothing else, it leaves an impression before the disc ends! Problems within the band led to a split in 1978. Vocalist John Sloman and drummer Dixie Lee formed a short lived band called Pulsar, before Sloman eventually replaced John Lawton in Uriah Heep in 1980, recording one album with them. Paul Chapman returned to UFO, with whom he’d briefly worked in 1974. He would remain with them until their first break-up in 1983. 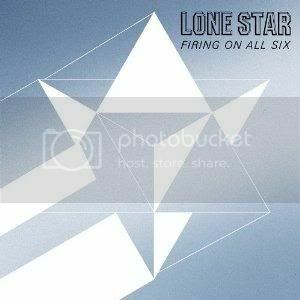 Although Lone Star have ever only been a brief note in the rock history books, ‘Firing On All Six’ has become a cult classic among fans of 70s hard rock – and deservedly so. A couple of songs miss the mark, but when Lone Star are, indeed, firing on all six – on ‘Bells of Berlin’, ‘Rivers Overflowing’ and ‘The Ballad of Crafty Jack, especially – they’re certainly a match for any of their contemporaries. This entry was posted in 70s, rock by Real Gone. Bookmark the permalink.